His son Josh had taken an interest early on, building a series of guitars as a teenager and then joining his Dad building mandolins in 2008. He’s been specializing in the F-5’s lately. Take a close look at some of the photos of his recent work and see for yourself. He’s proven himself to be one of the very best up and coming builders, re-defining with consistency the signature Pomeroy sound. There is a new and rapidly growing list of owners that can attest to that.. Rich, crisp tones that are at once full and resonant but with excellent pop and bark, all the way up the neck.. every Bluegrass players dream. Today, we have shops in both Glenwood Springs and in Crestone Colorado, at the base of the Sangre D’Cristo mountains. where 14,000’ glaciated peaks, graced with stands of Englemann Spruce, tower up just outside the shop doors, an inspiring setting for any luthier. 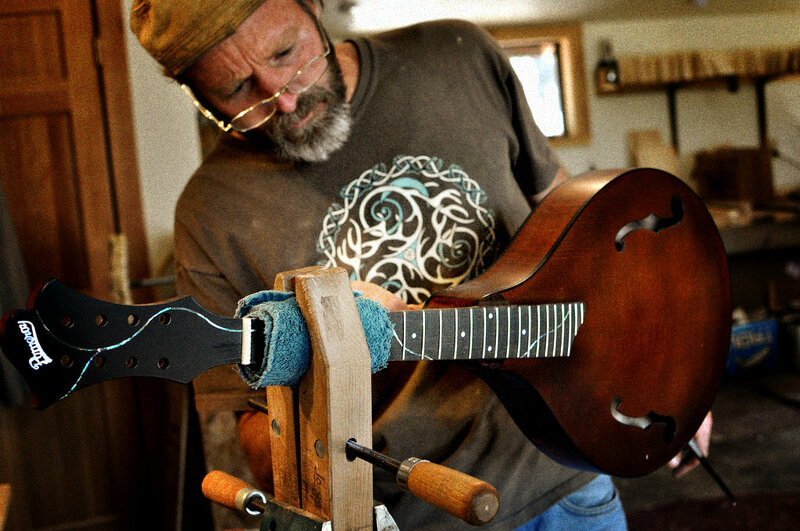 Don and Josh are committed to creating the very best mandolins. Their attention to detail in every respect has been honored by over 250 owners. And pricewise, they believe these instruments are one of the best values available. Visit our testimonials page to see what some of our valued customers have had to say. Please use our Contact Form or our give us a call!